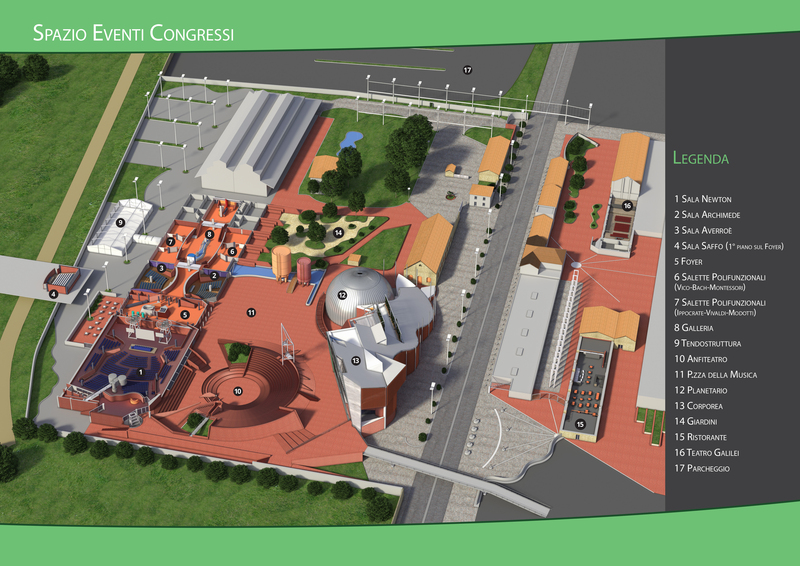 Città della Scienza owns the most significant Conference Centre of Southern Italy, with a wide and complex system of rooms, halls and areas, whose total capacity is about 2.000 seats made up of 13 rooms with a variable capacity between 10 and 1.000 seats. A “city” where events become refined, stylish and exclusive moments, made ​​unforgettable by the atmosphere of a place suspended between a past that is no longer, and a future that is already present. In a charming context thanks to its architectural beauty, and innovative for its high-tech content, the Conference Centre is a modern and prestigious location with versatile spaces and highly specialized services for organizing conferences, gala events, conventions and temporary exhibitions. In addition, it owns modular and multi-functional spaces, exhibition areas, large outdoor equipped areas, a 1000-seat amphitheatre and the Science Centre, in which organize events and gala dinners. Newton Hall gets 820 seats, with the possibility to reduce it to 400 through the use of panels. The hall is designed as an amphitheatre on steps, and seats are equipped with rollaway writing boards. Archimede Hall gets 150 seats in an area of 235 square meters. The hall is designed as an amphitheater on steps, with desks and a conference table of 6 seats. Averroè Hall gets 150 seats. The hall is designed as an amphitheater on steps, with desks and a conference table for 6 seats. Saffo Hall gets 100 seats. It is at the first floor of the H building, with desks and a conference table for 6 seats. Tensile structure is a modern air-conditioned facility of 525 sq mt (15×35 mt) next to the Conference Centre and connected to it by a tunnel that can be extended. This structure can be used as. - exhibition area of 525 sq mt. Gallery is an area of about 500 square meters, furnished with a fountain and a tree in the centre. It’s located along the pathway for the entrances of the halls, with a direct access outside. Arrangements, installations and equipments can be moved very easily. The Gallery is wi-fi equipped, and its location grants an easy unloading for setting up exhibitions and for the catering in support of congress activities. The rooms, overlooking the large Gallery, fully-connected and Wifi-equipped, can be linked each other all together, thanks to a system of moving partition walls. The rooms can be used as exhibition area, catering space, conference centre for small meetings up to 90 seats, meeting rooms, press rooms, secretarial offices.